Graniterock has been satisfying customers for over 100 years. Over time, we’ve found that professional experience and consideration for your needs are just as important as quality products. So we’ve designed Graniterock’s Transportation Services Division to deliver professional advice and expertise, and convenient and flexible customer service, right along with high quality rock, sand, and gravel products. Save valuable time by letting us coordinate the material delivery for you. By calling any Graniterock salesperson or dispatcher, or by contacting our Transportation Office directly, you can order the aggregate product you need and arrange for product delivery. 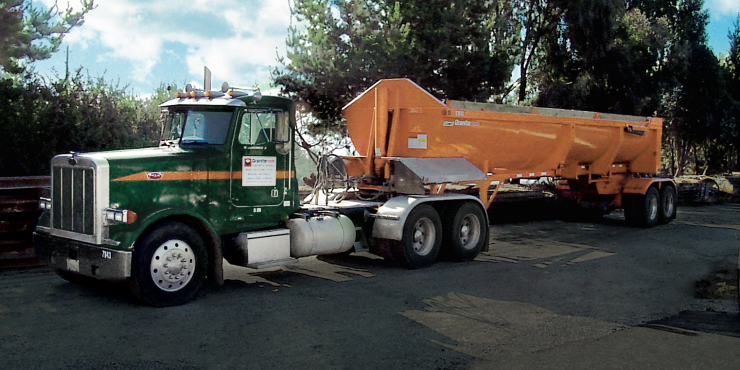 Choose from any kind of radio-dispatched aggregate delivery trucks—bottom dump, end dump, or transfer. We can help you determine the best choice for your particular jobsite. Graniterock can help you determine the best material for your job, and deliver that product directly to your jobsite. We will pick up from and deliver anywhere within our company service area, from South San Francisco in the north to King City and Big Sur in the South. Graniterock determines its aggregate price and delivery charges based on weight rather than on trucking time (excludes asphalt and Gabion materials, which are priced according to appropriate hourly rates). This way, you know your delivered price per ton up front. We’ll bill you directly for the materials and delivery on your Graniterock account, VISA or Mastercard. Courteous and helpful drivers are expert professionals who will place material on your jobsite according to your needs. Deliveries are made from all Graniterock quarries (located in Aromas and Hollister), and from most quarries located from Pleasanton in the north, south to Monterey. Granite Rock Company has privately owned railroad cars with the designation mark of GRCX, in addition to leased cars and Union Pacific cars dedicated to our service for a total fleet of over 500 railroad cars. Cars are shipped in unit trains for each rail order shipment. Graniterock partners with Union Pacific for railroad car maintenance and safety compliance. Graniterock can provide all their northern facilities with an overnight delivery service by rail. Over one third of the total shipments from the A.R. Wilson Quarry are shipped by rail. Graniterock has the capability of unloading rail cars with our Transload Xpress at most sites, and no unloading pit is required. Railroad car deliveries reduce truck traffic on our highway systems and reduces emissions into our environment. Graniterock started rail shipments with Southern Pacific in the early 1900s from the location known as Logan Siding and continues to ship railroad cars from the same location, now known as the A.R. Wilson Quarry, with plans to ship by rail well into the future. For excellent service, convenience, and firm, competitive prices, call Graniterock for purchase and delivery of rock, sand and gravel products. Call for a quote or to place an order today! Graniterock Transportation Division is located at Graniterock’s A.R. Wilson Quarry, Quarry Rd, Aromas, CA. The Transportation Division’s phone number is 831.768.2350.